Using up the last of the marinara sauce is always a little sad, but I know that in the next few weeks a new batch will be simmering away filling the house with that familiar Sunday sauce aroma and as luck would have it there was a nice container of saucy meatballs ready to plop into the sauce once they were thawed. I ended up crumbling a few meatballs into the sauce because they were very tender and ready to fall apart. 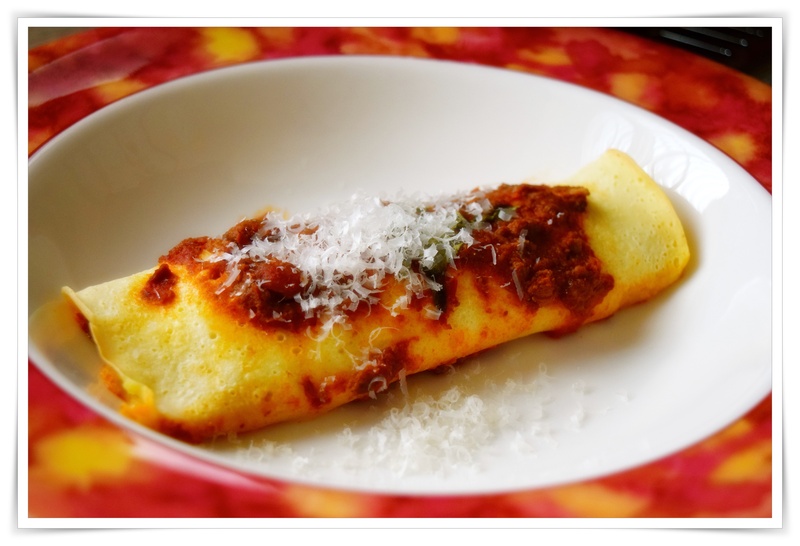 All that means is that I have plenty of time to make the thin crepes for manicotti and the ricotta filling. For the two of us I made 4 manicotti and one was enough for me along with a salad. 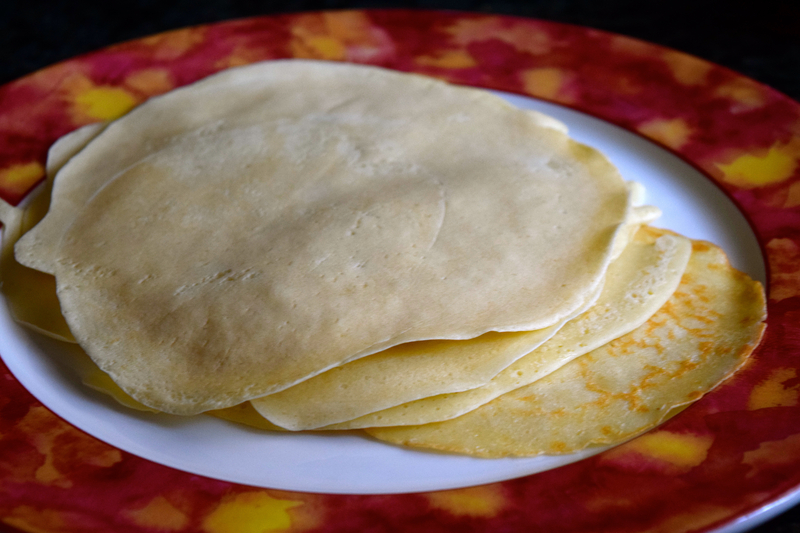 Make crepes in a nonstick crepe pan, use melted butter or a little canola oil lightly brushed on pan. Use a blender for the crepe batter, 1 cup of flour, 1 cup of milk, 1 egg, whisked, and a pinch or two of salt. You should have a very thin batter, add a little more milk if the batter thickens as you make the crepes. For the cheese and spinach filling blend together 2 cups whole milk ricotta, 1/4 cup parmesan cheese, a little minced parsley, 4 chopped mint leaves, a few fresh chopped basil leaves cooked chopped spinach, about 1/2 cup squeezed dry, salt and pepper to taste. Fill each crepe with 3-4 tablespoons cheese and roll. 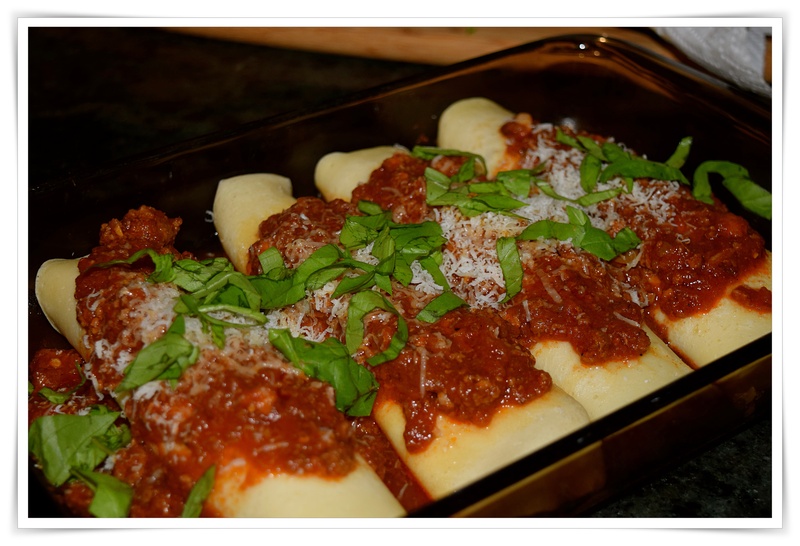 Put a little sauce into baking dish, add manicotti, spoon over more sauce and some chopped basil, bake at 350º for 20 minutes, top manicotti with more grated cheese and bake for another 5-10 minutes or until piping hot.